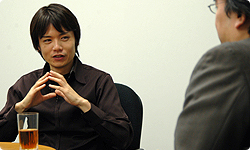 As I mentioned in the beginning, Smash Bros. Brawl for Wii was a title that many players wanted for Wi-Fi play. 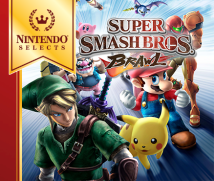 Therefore, making Super Smash Bros. Brawl available online in one form or another was a necessary premise. Since it was you that wrote the document, most of the features found in the final version of Smash Bros. Brawl are extremely close to what was written in the document. Well, there were lots of things that didn’t make it into the document too. At any rate, in the report, I covered, for the most part, how to deal with the online aspect of Smash Bros. Brawl. For example, when battling via the Internet, a player has the option to brawl With Friends or With Anyone. When playing With Friends, you can compose short messages, (See document) but when brawling with random players, however, names aren’t displayed and neither records nor brawling results are saved. (See document) This was very similar to what Nintendo was proposing for its Wi-Fi Connection (WFC) but at the time I finished the document in July of 2005, the WFC service didn’t exist. Not that we didn’t have it; we were actually in the middle of development. Naturally, we weren’t letting anyone else know what we were working on and I didn’t talk about any detailed features or concepts when I asked you to work on Smash Bros. 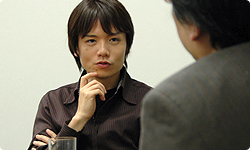 Yet, when we swapped the Smash Bros. Brawl document and the project plan for the Nintendo WFC and compared features, there was a great deal of correlation. It was quite surprising. (laughs) To me, online gaming had always been a place for the strong. One person would be living it up while hundreds or thousands of people were unhappy. I can’t completely reject this model of course, but as long as things remain this way, online gaming can spread only so far no matter what you do. I mean, even if people thought it looked interesting, most would hesitate to get involved and stay lingering on the sidelines. Therefore, we tried to think of ways to avoid this form of online gaming and ways to fashion an environment in which parents would feel safe letting their children play games online, debating at length on topics like how to create an online environment free of harassment. As a result, our concept of the WFC slowly began to take shape with two separate modes of play; players could play with friends or play with people they don’t know. It would be more about the fun of sharing rather than simply competing. Amazingly, these were the proposals I found in the first document you gave me. That’s right. When people think of playing Smash Bros. online, they think about battling opponents to see what happens based on their record of wins or losses, or about holding tournaments online. But I felt that this would make it a service from which only a select group of players could derive enjoyment. For Smash Bros., there are small communities here and there where there’s fun in winning and losing, even when there are more skilled players than others. But if you make an environment where everyone is trying to climb their way to the top of a single tall mountain, it’s clear that the people having fun would be limited to a small number of individuals. Those in the top five might feel pretty good about themselves, but what happens if you’re number 15,398 in the rankings? People considered formidable in their own particular community wouldn’t be the least bit pleased. Furthermore, since Smash Bros. is likely to have a broad gaming base, those that enjoy playing it within their own community might still end up number 100,000 in the rankings.